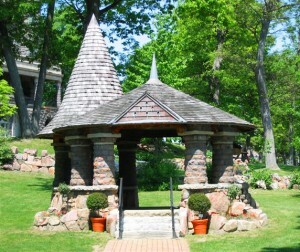 The Heart Island Gazebo is a favorite site for many annual visitors. Standing midway between the Alster Tower and the Main Castle thousands stop here every year to take in the view or take advantage of the shade it provides. It is also in close proximity to the Hot Dog Stand where guests can get a meal for an impromptu picnic! The Castle and Yacht House will remain open until 7:30 PM for Memorial Day Weekend, May 25th and 26th, Labor Day Weekend, August 31st and September 1st. As well as 6:30 PM on Columbus Day/Canadian Thanksgiving Weekend October 12th and 13th, 2019. Admissions Booth closes 1 hour prior to Boldt Castle closing. Boldt Yacht House opens and Boldt Yacht House Shuttle Begins running at 10:30am. Boat tours from both the U.S. and Canada stop at Heart Island. Extensive docking is available for private pleasure craft. A shuttle from Heart Island provides access to the Boldt Castle Yacht House. Rated #1 Thing To Do! Copyright © 2019 · Thousand Islands Bridge Authority | Boldt Castle · Site Design: Riverside Media, LLC.